Striping is our LINE of work! We serve a wide range of clients including pavement contractors, commercial and private property management firms, restaurant chains, schools and private business. 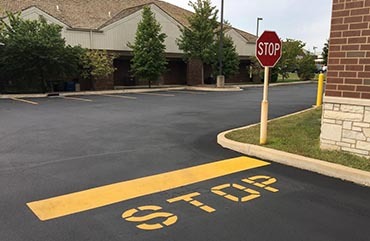 Brightfield Striping Company is a full-service pavement painting business serving St. Louis and the surrounding area with 30 years of experience. The image of a business is reflected by the appearance of the parking lot. 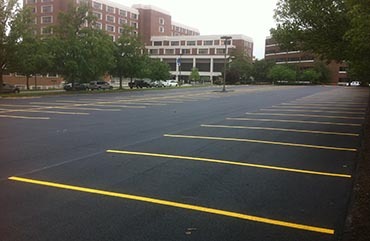 Keep your business looking clean, safe and professional with a well-marked, freshly-striped parking lot. We guarantee a finished job completed to the highest standards. We specialize in parking lot layout and design to ensure optimum traffic flow and maximum parking capacity while complying with ADA regulations. We optimize your parking space with a proper layout. Included are all the necessary pavement markings such as directional arrows, No Parking, Fire Lane, Visitor — just to name a few. We use only high-quality paint that is durable and long-lasting. To complete your parking lot needs we offer concrete and rubber parking stops. Additionally, we can provide and install the signs you may require. 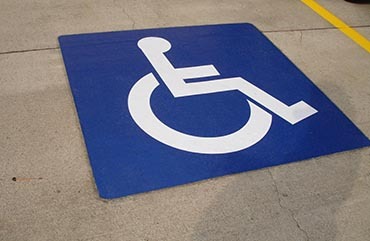 These metal signs may be standard such as "Handicap" or "Visitor" or custom. We can mount on bollards or building walls. Whether you need a parking lot designed and laid out or simply to re-stripe a faded one, call Brightfield Striping to get the job done.